This row of apartment buildings along 135th Street, which are part of Section 8 housing, will get a green makeover starting next month. 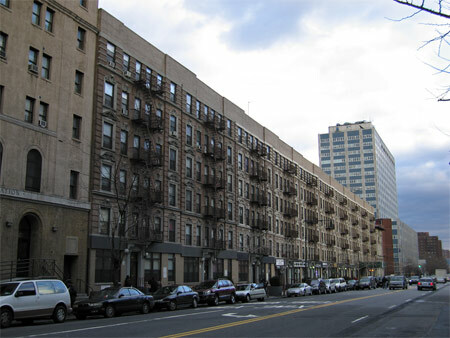 A crumbling row of ten Renaissance Revival apartment buildings, which were once the first black-owned property in North Harlem, are about to be remade again as one of a growing number of affordable, sustainable housing complexes sprouting up across the city. The project, which according to the Daily News, is set to begin by year’s end, is being tackled by affordable housing guru Jonathan Rose and his Smart Growth Investment fund, who bought the buildings in January as the fund’s first acquisition in its cheap-and-green portfolio. Dattner Architects, experts on both affordable and sustainable housing, is responsible for the retrofits [PDF], which include a photovoltaic array on the roof, efficient energy systems, lighting controls, new windows and insulation, and sustainably sourced materials. In addition to making it a more conscientious project, it also makes it a more feasible one, as these features open it up to stimulus and HUD moneys targeted at sustainable buildings—to the tune of $3 million.